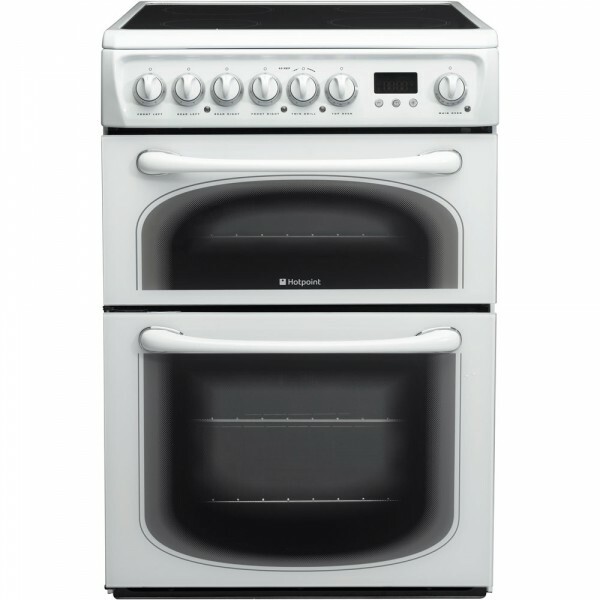 Product information "Hotpoint 60HEP Cooker Ceramic Double Oven 60cm"
Finished in stunning Polar White finish, the Hotpoint 60HEPS Cooker is equipped with four ceramic radiant cooking zones on its hob. The easy to use control knobs on the front of Hotpoint 60HEPS Cooker provide stylish looks. The 71 litre main fan oven and 39 litre second oven with integrated solarplus grill provides you with no end of cooking choices. The electronic programmable timer offers peace of mind. The catalytic liners in the ovens work by using the heat of the oven to break down grease and fat; so you can spend more time cooking and less time cleaning. This thoroughly contemporary, B energy rated Hotpoint 60HEPS Cooker will help you to prepare great meals in no time. Related links to "Hotpoint 60HEP Cooker Ceramic Double Oven 60cm"
Customer review for "Hotpoint 60HEP Cooker Ceramic Double Oven 60cm"